Please Note: With the marketing team attending the APHA Conference next week, there will not be a Weekly Roundup on November 10, 2017. Dr. Suzanne Babich presented at the 10th Annual European Public Health Conference held this year in Stockholm, Sweden. The EPH Conference aims to contribute to the improvement of public health in Europe by offering a means for exchanging information and a platform for debate to researchers, policy makers, and practitioners in the field of public health and health services research as well as public health training and education in Europe. Dr. Babich joined Professors William Sherlaw and Olivier Grimaud, faculty from the EHESP School of Public Health where she had the opportunity to visit days before. During the campus visit, Dr. Babich and M1 (first year) students in the EHESP School of Public Health had a chance to hear from health economist Prof. Isabelle Durand-Zeleski regarding the French healthcare system. The Center for Health Engagement and Equity Research recently released an issue brief that identifies Peer Recovery Coaches to be an underutilized tool to combat the opioid epidemic in Indiana. With evidence regarding the use of PRCs as an effective OUD treatment tool continually strengthening, the expanded use of PRCs is expected to grow. Thus, resulting in higher treatment access, engagement and ultimately lower rates of opioid-related mortality. 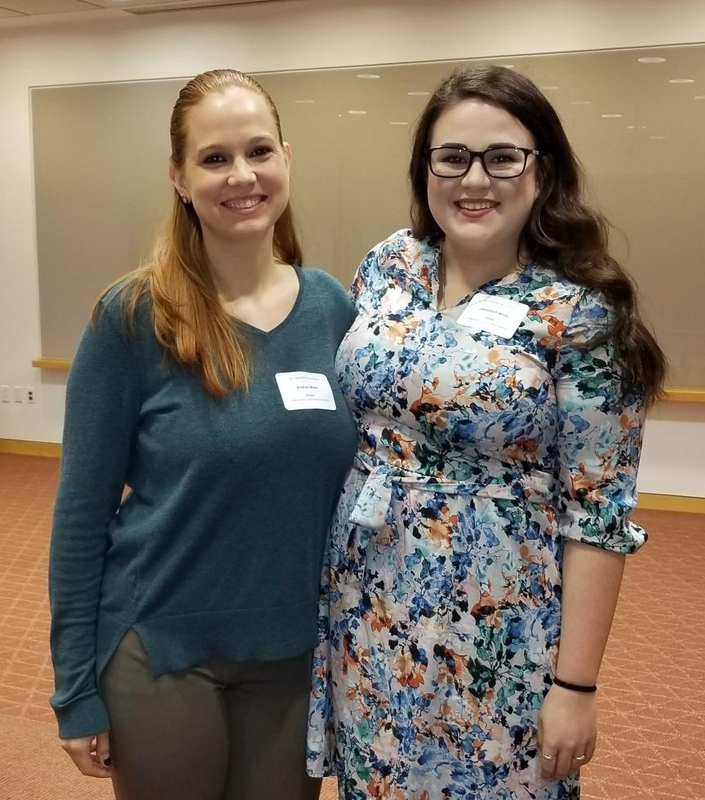 Two BSPH-CH students, Andi Miller and Jessa White, participated as a team and tied for first place (with UIndy) in the student case study competition at the Indiana Society for Public Health Education Conference this week. The case study focused on reducing infant mortality rates in an Indiana community by addressing cigarette smoking during pregnancy through community intervention planning. Dr. Cuilin Zhang earned a medical degree from Beijing Medical University, and both her MPH and PhD in epidemiology from the University of Washington. She received postdoctoral training in genetic and nutritional epidemiology at Harvard University and has published more than 150 peer-reviewed papers in high-impact clinical journals. Dr. Zhang is currently a tenured senior investigator in the Division of Intramural Population Health Research at the National Institutes of Health (NIH). Consisting of both genetic and non-genetic biological markers and potentially modifiable exogenous factors, Dr. Zhang’s research focuses on the determinants and health consequences of cardio-metabolic disorders based on a life course approach. She also has long-standing research experience in fetal origins of chronic diseases, life course epidemiology, and modifications of diet and lifestyle to improve reproductive outcomes and child health. Monosodium Glutamate (MSG): A Risk Factor for Obesity? Findings and Debates. Dr. He is a nutrition epidemiologist. He received his ScD in Nutritional Epidemiology from Harvard University, MPH from Tufts University and medical degree from Soochow University. Dr. He was an Assistant Professor of Preventive Medicine at Northwestern University, and a tenured Associate Professor of Epidemiology and Nutrition at University of North Carolina at Chapel Hill. Dr. He is an elected fellow of American Heart Association (AHA), American College of Epidemiology (ACE), and American College of Nutrition (ACN). His primary research interests lie in nutritional epidemiology, specifically, diet and nutrients in relation to chronic diseases. Dr. He is the Principal Investigator of a few NIH-supported projects, including a study on protein, amino acids and obesity. Dr. Chen earned his M.D. from TianJin Medical University in TianJin, China, and Master's degree from the Chinese Academy of Preventive Medicine in Beijing, China. In 2001, he earned his Ph.D. in Nutritional Epidemiology from Tufts University in Boston, MA and then worked as a Research Fellow and Instructor at the Harvard School of Public Health. From 2005-2016, Dr. Chen worked at the Epidemiology Branch of the National Institute of Environmental Health Sciences and received his Tenured Senior Investigator appointment from NIH in 2013. He serves on the editorial board of the American Journal of Epidemiology and has about 150 original publications. His research focuses on neurodegenerative diseases, especially Parkinson's disease. He works on several large prospective cohorts to ascertain the environmental and genetic causes of Parkinson's disease and to characterize high-risk populations through research on prodromal symptoms and biomarkers. The ultimate goal is disease prevention and more effective clinical management. The Faculty Teaching Showcase webinar series is a venue for faculty to share their teaching practices with one another. Designed to inspire, inform and give faculty the confidence to try new teaching strategies, each interactive webinar features a conversation with a faculty member about how they implemented a successful teaching technique. Each webinar is 30 minutes long with an optional 15-minute follow-up discussion period. Faculty from a wide variety of schools and departments and with all appointment types are featured in this series. Dr. Emily Ahonen and Dr. Dennis Watson recently published “Alpha test results for a Housing First eLearning strategy: the value of multiple qualitative methods for intervention design” in the Pilot and Feasibility Studies journal of BioMed Central. Before a product is beta tested in the real world, it goes through alpha testing, an approach usually used for improving a product before it is tested in the market. The study found that alpha testing is also a valuable step for intervention development and helps reveal issues that would be more difficult to tackle at a later developmental stage. In particular, through a multiple-methods approach, the researchers were able to identify and correct factors which are key to the success of the intervention, and which otherwise might have confused the understanding of outcomes of the intervention in later phases. With detailed descriptions of implementation strategies and development at a low, this article serves as a resource for researchers interested in the methods and findings related to alpha testing prior to piloting. The FSPH Drug Take Back event, hosted by our school in partnership with the Indiana Prescription Drug Abuse Task Force, was yet another success! A two-day event, the Drug Take Back allowed participants to turn in unused or expired medication for safe disposal. Any drugs handed over were considered anonymous and incinerated after drop off. This event helped to reduce the amount of medications that might be disposed of by flushing, which is harmful to our environment and water systems. Held in in Tampa, Florida this year, the Product Stewardship Society’s annual conference brought together professionals from over a dozen different industry sectors and throughout the value chain. Dr. Steven Lacey, product stewardship faculty members Steve Benoit and Gail Hart, and several other FSPH team members attended the conference. Tom Grumbles, President of the Product Stewardship Society, opened the Stewardship 2017 conference, and Dr. Darius Sabaliunas of Proctor & Gamble gave the opening keyknote, focusing on the opportunity and responsibility of product stewardship. Now that the semester is ramping up and we've gained a number of new faculty and staff members at Public Health, Clinical Affairs IT Services (CAITS, a division of UITS) would like to remind FSPH faculty and staff of the wide range of support at the school including email, phone, and in-person assistance. For all non-urgent IT issues, please create a ticket by simply sending an email to caits@iu.edu with as much detail as possible. This ticket will be triaged accordingly and assigned to a technician or escalated as necessary. Creating this ticket ensures that the issue will be resolved by CAITS staff in the most efficient manner possible and never missed in the shuffle of an individual's inbox. For all urgent IT issues, please call the CAITS Help Desk at 317-274-5336 or visit the onsite technician, Zach Wilson, at RG 6079, if available. Sending email alone is not recommended if an issue needs urgent attention. For more information on CAITS, visit https://caits.iu.edu. Another fantastic resource to answer many common IT questions is the IU Knowledge Base (KB), available via its corresponding task in One.IU or by visiting https://kb.iu.edu. There are many other IT resources available at IU for specific needs. Visit https://kb.iu.edu/d/amgy for a short list, or contact CAITS for more details. This daylong event brings professionals from multiple disciplines to share and present efforts in interprofessional practice and/or education being conducted or recently completed in Indiana. There will be a variety of presentations including a plenary, 16 oral presentations, 2 panels, 20 poster presentations and 2 workshops. The Hall Center for Law & Health Grand Rounds series continues on Thursday, November 9, 2017, with a presentation from Professor Leo Beletsky, JD, MPH, Associate Professor of Law and Health Sciences for the Northeastern University School of Law. Professor Beletsky’s presentation, “Murder by Overdose: Deploying Punishment as an Antidote to the Overdose Crisis,” will be held at Inlow Hall from 4:30 p.m. – 5:30 p.m. in classroom 385. The session has been approved for one (1) hour of Indiana Continuing Legal Education credit. Date & Time: Wednesday, November 1, Noon to 1:00 p.m.
Indiana is one of five states without a law addressing penalties for hate crimes that target people because of certain characteristics, such as race, religion or sexual orientation. Join Indiana Senator Greg Taylor (D) and David Sklar, Director of Government Affairs at Indy JCRC to learn about bi-partisan efforts toward change. Event will be held at University Library, Lilly Auditorium (Room UL 0130). Where do you stand? Reveal your convictions by where you stand in the room, and join our kinetic conversation on the power of persuasion, empathy, and compassion. Robert F. Kennedy’s speech in Indianapolis the night Dr. Martin Luther King, Jr. was murdered implores us to use the power of compassion to find understanding. This deeply participatory event illustrates the power of words and conversation to persuade and build empathy for others. Starting with the ideas of compassion and empathy that emerge from Kennedy’s 1968 speech, participants will be asked to physically stand their position around complicated questions and then potentially—and physically—shift their position as new perspectives are shared. This free event will be held at 16 Park Community Center, 546 East 17th Street, Indianapolis. Walk-ins welcome, but registration encouraged by November 5. Date & Time: Thursday, November 9, 6:00 p.m. In preparation of Winona LaDuke ‘s visit, the IUPUI Multicultural Center is showing First Daughter and the Black Snake. Below is a brief description of the film and a link if you would like to learn more. The “Prophecy of the 7th Fire” says a “black snake” will bring destruction to the earth. We will have a choice of two paths. One is scorched, and one is green. For Winona (Ojibwe for “first daughter”), the “black snake” is oil trains and pipelines. When she learns that Canadian-owned Enbridge plans to route a new pipeline through her tribe’s 1855 Treaty land, she and her community spring into action to save the sacred wild rice lakes and preserve their traditional indigenous way of life. Movie will be shown in room UL 0130 of the University Library, Lilly Auditorium. Date & Time: Thursday, November 16, 6:00 p.m.
Winona LaDuke is an internationally renowned activist and Program Director of the Honor the Earth working on issues of sustainable development, renewable energy and food systems. She has been especially active fighting against the fossil fuel industry’s abuse of indigenous lands and waterways. She lives and works on the White Earth reservation in northern Minnesota, and is a two-time vice presidential candidate with Ralph Nader for the Green Party. Lecture will take place at the Campus Center, room 450 A & B. Join us for an overview and discussion of the research data services offered by the Indiana CTSI Research Data Services and Regenstrief Data Core. Each speaker will briefly describe the services their groups provide and answer questions. Do you store or analyze research data containing PHI on IU systems? This session will walk researchers through the additional physical, administrative, and technical safeguards necessary to work with critical data appropriately. This panel of researchers in the humanities and social sciences will discuss practical strategies in dealing with human subjects data in their field. Each will describe the most common issues they face and share resources or strategies for addressing those challenges. Finally, audience members will have time to ask questions of the panel. The Data Topics Series is co-sponsored by the Ruth Lilly Medical Library & IUPUI University Library. Human rights in patient care (HRPC) provides an alternative to the growing discourse on patient rights that has evolved in response to human rights violations in health settings. The work for human rights in patient care is facilitated by a network of schools of law, medicine, and public health, along with practicing lawyers, health care providers, health managers, and others, within the European Region. Their work derives from inherent human dignity and neutrally applies universal, legally recognized human rights principles, protecting both patients and health care providers. It recognizes the interrelationship between patient and provider rights, including situations in which providers face simultaneous obligations to patients and the state and is a way to examine systemic issues and state responsibilities in the realm of delivery of health care services. Now that the Trump administration has been in place almost a year, the outlines of its policies for healthcare and the life sciences industry are beginning to emerge. Top administrators at the CMS and FDA are beginning to make their influence felt within their organizations. Speakers and panelists will connect the dots as to the likely effects on things such as new product approvals, off-label usage, and healthcare coverage and reimbursement. Clayton Christensen's book, The Innovator's Prescription, applied his disruptive innovation model and framework to the healthcare and the life sciences, providing a new way to think about sources of change to the industry. Major changes are more likely to come from firms and organizations outside of its current, established players, e.g., Google, Apple, Amazon, and Samsung. This conference will look at what's bubbling at these potential new additions to the industry mosaic. As more and more data is captured and newer algorithms are developed to parse it, new opportunities to improve healthcare outcomes are being unearthed. These findings, however, pose a range of questions including ownership of the data and concerns about an individual's privacy. Balancing these competing forces will be a continuing challenge in healthcare. Stakeholders and observers will share current best practices incorporating the flood of new data and offer their opinions as to where things will likely shake out in the future. Register for all three conferences and save $75 for the series! The Plater Institute on the Future of Learning for 2017 will address the overarching theme Nurturing a Community Culture of Health through Interdisciplinary and Integrated Approaches. The program will include the keynote address by Dr. Alonzo L. Plough, vice president, research-evaluation-learning and chief science officer, Robert Wood Johnson Foundation; a panel discussion entitled, Interdisciplinary and Integrated Approaches to Nurturing a Community, moderated by Dr. Robin Newhouse, dean, School of Nursing; and a working lunch with facilitated table discussions on various topics relevant to the theme. The deadline for abstract submissions has passed. This one-day course provides instruction in the skill sets needed to deliver the triple aim, focusing on the theoretical and applied knowledge to successfully localize, implement, and evaluate evidence-based practices, as well as innovate and invent new models of care and process. The IUPUI Staff Council is sponsoring two shelves for Paws Pantry for the next year. The pantry serves not only the students here at IUPUI, but is also available to staff and faculty as well. Paws Pantry connects with the campus and the community to advocate for those who experience food insecurity. It is an organization created by students, run by students and sustained though passionate involvement and volunteering. The two shelves that Staff Council will be sponsoring are Pasta and Breakfast. Each month, 20-30+ items will be needed for each shelf. If you are interested in donating to the pantry, please drop off your donations with Amanda Briggs in RG 6063. Pasta: Spaghetti, Ravioli, Fettuccine, Elbow etc. Pasta Sauce: Tomato, Alfredo, Meat etc.